James Allen Noyes (my line), son of James Noyes and Sally Marble, had a number of half-brothers and half-sisters by his father’s second marriage to Susan Waters, but as far as I’m aware only two of those half-brothers survived to adulthood, George W. Noyes and Franklin L. Noyes. 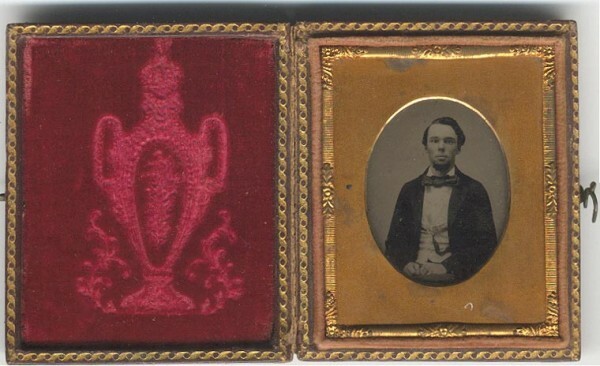 We have two pictures of half-brothers, one in Civil War uniform and one in civilian, but as both of these men served in the Civil War we’re unable to distinguish which photo depicts which brother. George W. Noyes was born May 8 1840 in Pavillion, Kalamazoo, Michigan and died March 3, 1870 at Pavillion (according to the family record). He married a woman named Emaline Melvina Aldrich and they had two children, Maud, born 1867, died May 3 1870 in Pavillion, and Henry A., born November 1869 in Pavillion and died March 9 1870 in Pavillion. 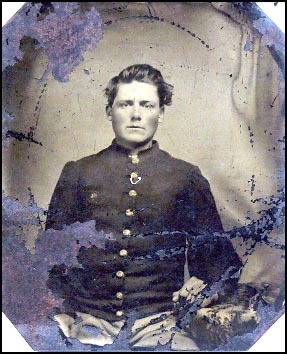 George served in the Civil War in Company K, the 87th Infantry Regiment out of New York. 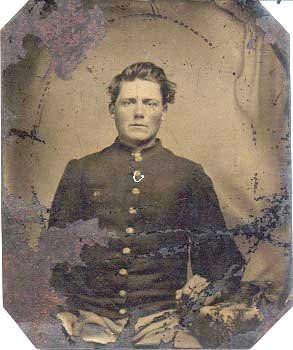 Service Record: Enlisted in Company K, New York 78th Infantry Regiment on 08 Apr 1862. Mustered out on 12 Jul 1864. Transferred to on 12 Jul 1864. George, in the family record, is given as dying 1870. However, he appears in the 1870 census with “Madeline” or Melvina (would be his wife Emaline Melvina Aldrich). I have seen him elsewhere given as dying in 1871. The Noyes Descendants, Vol. I says 3 Mar 1870. Ae. 30 y 9 m 25 d. Died of consumption. Michigan death records gives him dying March 3 1870. 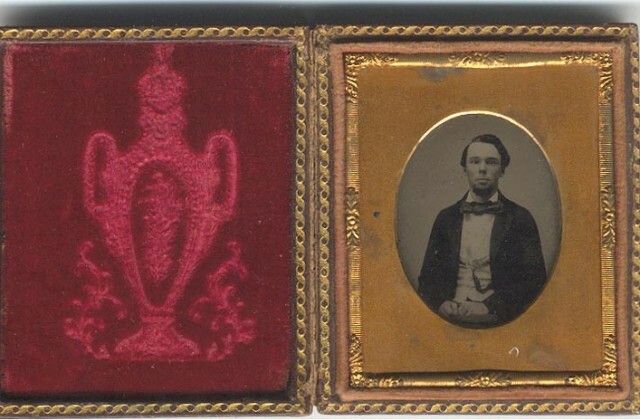 Franklin Noyes was born July 24 1845 at Pavillion. He was married in 1865 to Margaret A. Aldrich, sister of the above Melvina, who died in 1878 or 1873 (according to Find-a-Grave). Frank served with Company K, New York 78th Infantry Regiment. They had Annie M. born March 28 1867 married a man named Rheynard, William L. born March 23 1870, Louie Noyes who was born Oct 3 1870 and died Jan 12 1871, and Maude M. Noyes who was born 1873 and married a man named George Middleton. Louie’s Cemetery record gives the birth and death dates as here. The Col. Henry E. Noyes and Harriette E. Noyes Genealogical Record of Noyes Descendants gives his birth 3 Oct 1868 in Michigan. However, Louie doesn’t appear in the 1870 census, which was recorded the 20th of August. But William was only 3 months old in the 1870 census, and Louie is given as born the 3rd of October. The family record appears to give Franklin as dying July 28, 1871 but the 1871 is instead 1891. The 1880 Yankee Springs, Barry, Michigan shows him and two of his children he’d had in his first marriage. This is his headstone at Find-a-Grave and gives him dying July 29 1891. He married 2nd a Clarissa (Clara) Hubard/Hubbard 1878 Feb 3 in Yankee Springs, Barry, Michigan. The Noyes family was particularly tragic in the way it was struck over and over with premature deaths, many said to be victims of malaria. The photos are courtesy Nancy Benton, from the family of James Allen Noyes. Frank’s wife Margaret and son Louis are buried at McKain Cemetery in Pavilion, Michigan, as are George W. and his children Henry A. and Maud.